I'm so excited to be guest posting today at Confessions of a Cookbook Queen! If you've never visited Kristan's site, you're really missing out. She's a kindred spirit with a flair for pink, glitter and all sorts of creative confections (Angry Birds Cupcakes, anyone?). 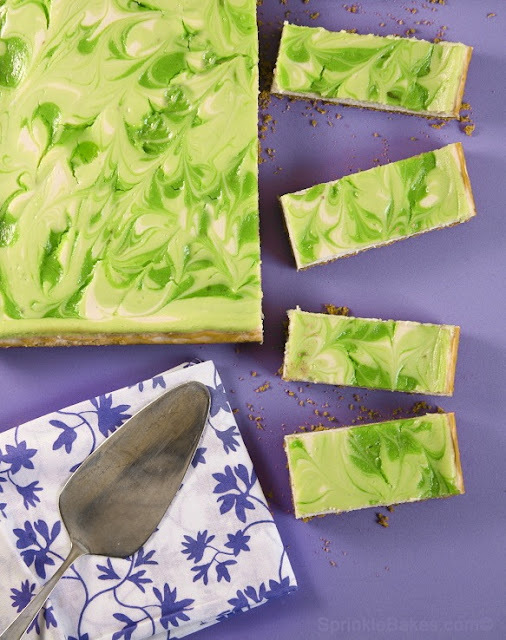 Hop on over for the details on my dreamy Key Lime Swirl Cheesecake Bars. How pretty! I haven't ever seen a swirly green like that. Want to make these for my dad - he LOVES key lime anything! I love citrus and out of all of them, Key lime is my favorite. I recently made a key lime pie, but your bars looks soooo pretty. Makes my mouth water just thinking about it. These look fun! I'm pinning it to my Pinterest so I remember to make these! Quero lhe dizer que sou sua fã! Adoro o seu trabalho e fico encantada com as bonitas criações suas! Votei em seu blog no Concurso da Saveur! Um grande beijo e continue sempre a nos presentear com seu talento! Purple and green is my absolute favourite colour combination. And you did it so well. Fun! Fun! Love the swirl. Love the green. HOW am I going to make everything you post. There isn't anything so far that I do not drool over! Guest posting? How awesome. That is a gorgeous green swirl! That looks so pretty! :) Sounds delicious too! looks yummy and delicious.love the color!! Gorgeous. The color on those is simply fantastic. I'm definitely one of those people who eats with my eyes first so those look gooorrrrgeous! Oh finally!! My 2 favourite bloggers combine forces! LOVE this! i love the photos on the purple/lavender backgrounds! totally beautiful…totally!! & the "sweet treats" look amazing & i cannot wait to try this recipe! once again…thank you so much! Awesome!! This is so lovely. YOUR BLOG, JUST ONE WORD: UNSURPASSABLE!!! Felicidades por tu blog, acabo de descubrirlo y me he quedado encantada. Voy a echar un vistazo por tus recetas que me parecen fantásticas. Beautiful, they almost look like wallpaper they are so pretty. We love anything key lime so I know we will love these! These are so beautiful. I tried making key lime bars not long ago, but it ended in a bit of a disaster. My graham cracker crust actually floated to the top of the pan while baking. i made a tray for the kids at school and they adored them, esp the colour! My graham cracker crust actually floated to the top of the pan while baking. I'm not generally a fan of key-lime anything, but these look too pretty to pass up! Beautiful! I clicked over to find the recipe and got an "Page not found" error - HELP! Thanks so much for pointing this out. I'm not sure how I missed your comment Heidi, but I'm correcting the link now. Thank you Lesa. Kristen moved from blogspot to wordpress... I think that may be why the link is bad now. I'm trying to make these, but I can't see where it says how much sour cream and vanilla. I don't see it on the ingredients list, only in the directions. Please help - thanks! 1/2 cup sour cream and 1 tsp. vanilla extract. Thanks for pointing this out! I'll contact Kristan so she can add these ingredients! I just made your key lime swirl cheesecake bars. Awesome. Everyone loved them. I was wondering if you have a receipe for strawberry curd?